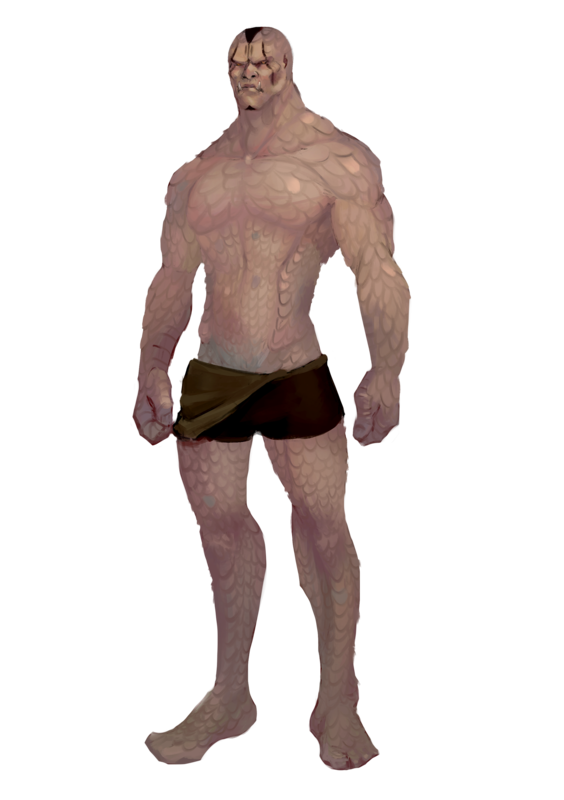 Reg’ostrans are a tall and powerfully built reptilian race. Originally from the sunken continent of Kal, most surviving Reg’ostrans migrated to Tharstelding and Dayrmacia shortly after the destruction of their ancient homeland. Personality: Reg’ostran society places emphasis on strength, ability and family. Little regard is given to creativeness or deep thinking. This, chief among many things, is the trait that holds them back in Tharstelding. Reg’ostrans care deeply for their youth, and will often display odd traits of empathy, curiosity and affection to not only their offspring but other Reg’ostran children. In the lands of Kal, Reg’ostrans had a well developed civilization that placed complex emphasis on the raising of youth. Most people that have had exposure to a Reg’ostran would describe them as socially alien, soft mannered but short fused, and independent. Physical Description: Reg’ostrans are ectotherms (cold blooded), that prefer moderate to warm climates. Reg’ostrans are asexual, neither male nor female, each Reg’ostran gives live birth, producing between 4-8 offspring over a course of time between the ages of 14 and 30. A Reg’ostran usually stands between 6’ and 7’ tall, and usually weighs between 200 and 300 pounds at adulthood. Eye color can be either red, yellow or orange. Reg’ostrans are bipedal and shaped like humans, however they do not have hair. Reg’ostrans have a coating of large flat scales that at a distance can easily be mistaken for human skin, due to it’s coloration and fine interlocking design. Reg’ostrans have no ears but otherwise hear just as well as a human. Reg’ostrans do not have teeth, but rather a sharp protruding jawbone covered by thin lips that serves the same function. Relations: When Kal was a thriving continent Reg’ostrans had bitter conflict with the Humans of Tharstelding. Although long ago, some of the tension these two races shared is still exhibited today. Some establishments within cities will not serve Reg’ostrans, and most Human civilizations see them as second class citizens, suitable only for labor. Dwarves and Elves have as little exposure to Reg’ostrans as they do to each other, and often judge them as they meet them. Although they have had their differences in the past, Reg’ostrans and Thirvolans share a sorrow for the loss of Kal, these two races often interact peacefully. Alignment: Neutrality in all aspects comes easy to the Reg’ostrans. Philosophy in regards to law and chaos is a scorned trait, the well being of the individual and of the race is foremost in importance. Between good and evil most Reg’ostrans will gravitate to good, showing signs of affection to young members of the Reg’ostran race. Evil Reg’ostrans are rare but they do exist, often living in isolation from the rest of Reg’ostrans. Reg’ostran Lands: Reg’ostrans were the ruling race of Kal when it was above the waves of the Northern Reach. Reg’ostrans have lost their home lands and have no cities of their own, they usually develop “nest“ communities within larger cities. Religion: Most Reg’ostrans pay little heed to the gods of Tharstelding and worship the elements of Draconspire; earth, fire, air, and water. Some Reg’ostrans have come to adopt the gods of Thatstelding, with special scorn for Lenarsiz, cursing him for the destruction of their homeland. Glitanius is sometimes given special praise and worship for the well being of Reg’ostran offspring. Reg’ostrans that migrate into Pax Thallos sometimes adapt to the worship of the Sendar, the Sand God. Languages: The Reg’ostran language, which uses its own script of symbols similar to draconic, is an old and rarely used language. Most of the literature of the Reg’ostran race was lost when Kal sank beneath the waves of the Northern Reach. Little in the works of philosophy, poetry and creative stories have been written by the Reg’ostrans. Their writings usually tell tales of family, childhood lessons, Reg’ostran heroes and feats of great skill. The Reg’ostran society had developed a calendar long ago, but with the destruction of their homeland and generations that have passed they have adapted the Calendar of Man. Names: Upon birth a Reg’ostran is named by their parent. Names consist of a nest name (the same nest name as the parent) separated by an apostrophe and followed by a gifted name. Very common nest names are; Tek, Sel, Kal, Tirsk, Lel, Ult and Qualk. These nest names are most common as they are descended from the ruling families of Reg’ostran society in Kal, whose members made it over to Tharstelding in larger numbers than the common folk. Common gifted names are; Selsik, Yelsidt, Qwolpt, Heldyt and Zelkyr. An example of Reg’ostran names would be; Tek’Selsik, Kal’Heldyt or Tirsk’Zelkyr. Adventurers: Having no place to truly call home in Tharstelding adventuring comes easy to the Reg’ostran. Being a race without kingdoms or leaders, they often struggle to find ways to fit in. Often misunderstood at first, an adventuring group unfamiliar with this race quickly comes to appreciate the natural adventuring talent that any Reg’ostran brings to the party. +2 Strength, +2 Constitution, -2 Intelligence, -2 Charisma: Very large and strong, the Reg’ostran race is not as mentally developed or as well placed in society as the native races of Tharstelding. Medium: Reg’ostrans are medium creatures, however see powerful build below. Normal Speed: Reg’ostrans have a base land speed of 30 feet. Powerful Build (Ex): The physical stature of a Reg’ostran lets them function in many ways as though they were one size category larger. Whenever a Reg’ostran is subject to a size modifier or special size modifier for an opposed check (such as when making a CMB check during grapples, bull rush attempts, and trip attempts), the Reg’ostran is treated as one size larger is doing so is advantageous to them. A Reg’ostran is also considered to be one size larger when determining whether a creature’s special attacks based on size (such as grab or swallow) can effect them. A Reg’ostran can use weapons designed for a creature one size larger without penalty. However their space and reach remain those of a creature of their size. The benefits of this racial trait stack with the effects of powers, abilities, and spells that change the subjects size category. Ectothermic (Ex): A Reg’ostran is cold blooded. When in a cold climate (an area under 40 degrees) a Reg’ostran must make a constitution check DC 15 every hour. Failure to succeed at this check results in the Reg’ostran becoming fatigued. The Reg’ostran remains fatigued until they exit the cold climate and remain in an area above 40 degrees for at least an hour. In addition, if a Reg’ostran is subject to and takes damage (lethal or non-lethal) from a spell or similar effect with the cold descriptor they must make a constitution check DC 15. Failure indicates that the Reg’ostran acts as if under the effect of a Slow spell for 3 rounds. If no damage is taken from the attack the Reg’ostran is unaffected in this manner. Genderless (Ex): Any item or effect which relies on a targets gender or sexual attraction, such as a Nymph’s Blinding Beauty or a cursed item which changes its wielders gender, has no effect on a Reg’Ostran. Naturally Athletic (Ex): +2 Racial bonus on all acrobatics, climb and swim checks. Reg’ostrans are naturally very athletic. Feat of Strength (Ex): Once per day a Reg’ostran can add double their strength bonus to a single strength check. A Reg'ostran gains an additional daily use of this ability at 5th, 10th, 15th and 20th level. Languages: A Reg’ostran speaks common and Reg’ostran.